Your first task in finding a post office job, is to register for an online account at the USPS website. You must enter your name and e-mail and choose a user name and password. TIP: Your username must be at least 6 characters long. Your password must be at least 15 characters long, contain one UPPER CASE character, and one number (1,2,3 etc.). Also, the first three characters cannot be the same. The website will then lead you through a series of screens to complete your profile. Make sure to be accurate when you complete the application and use the most recent information. 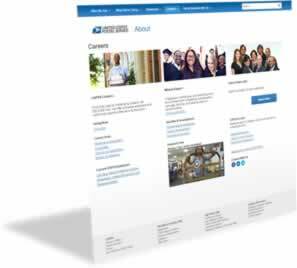 The US Postal Service provides a listing of all of their open jobs on their web site. You can refine your search by specifying keywords, selecting locations, and choosing a functional area. The majority of open positions are in the “Delivery/Customer Service” functional area, but there are typically openings in many functional areas, and many locations. To find out which positions you may be interested in, please check out our USPS Job Descriptions. Once you see a post office job that you are interested in, select “Apply” and you will be taken to your online profile/account that you set up in step 1. After you have selected “Apply” from step 2, you will be directed back to your online account/profile. Now is the time to make sure you have submitted your experience, education and skills that match the requirements of your desired post office job. You should also take the time to create and upload a summary of accomplishments and an up-to-date resume. You will need to take a postal exam (for most positions). The vast majority of USPS positions (such as mail processors, handlers, city/rural carriers, and sales/service associates) will have to take and pass Postal Exam 473. You must do well on the postal exam (score greater than 70) – but a good score does not guarantee a job offer. TIP: Active duty military personnel and veterans are eligible for either a 5 or 10 point Veterans’ Preference. The interviewer will be making a hiring recommendation to the person responsible for hiring. The process will take a long time – plan to spend up to 2 hours on the entire application. You must use a Windows-based desktop computer. The USPS application system is not compatible with Apple/Mac products (including iPads and iPhones). You should be using either Internet Explorer or Firefox as your web browser. Fields marked with an Asterisk (*) are required. You must fill out these fields to advance to the next screen. Pay special attention to the requirements outlined in the USPS job posting. The best applications will show how your training, education, experience/skill set matches each of the requirements. The best way to complete the Summary of Accomplishments section to create a separate document that shows how your education, experience, skills, and training matches the job posting. It is a good idea to attach/upload a recent resume.